The expansion of Twitch from just video game content continues. The Twitch Creative section has a new channel focused on showcasing cooking streams: Twitch.tv/Food. 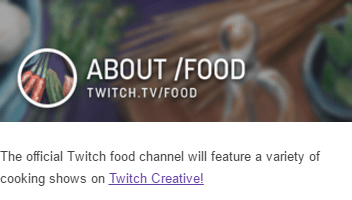 Creative streamers can use #food in their title for their cooking streams for a chance to have the show featured on the Twitch Food channel, which will be running 24/7. Creative streamers should also tweet to @TwitchCreates for an increased chance of getting their stream noticed. To kick off this new feature, the Twitch Food Channel will be broadcasting all 201 episodes of Julia Child’s cooking show, The French Chef, starting today at 2pm PST. You can subscribe to the Food channel and get access to 23 emotes. In addition, three global emotes have been released that anyone can use: NomNom, StinkyCheese, and ChefFrank. The Food Channel also has a section beneath the stream called “Posts” that will be used to share information about the channel and broadcasts that are featured. Viewers can “Like” the posts and share them. Is this a potential new feature that will be made available to other channels? For more information about this latest update, check out the official Twitch blog.